Massey Mustangs Boys Basketball player Sean Mei gave back to his community by helping officiate a Windsor Valiants basketball game. He was joined by former Mustang Ben Scaria as well. Read the full article here. The host Massey Mustangs won the Junior Mustangs Classic boys’ basketball tournament championship. Massey beat the St. Joseph Lasers 65-60 in the final with the backcourt tandem of Nyles Duren and Amjed Alghizi leading the way. Duren had 37 points in a semifinal win over the St. Anne Saints, which went to double overtime. Massey is unbeaten in WECSSAA junior boys’ play at 8-0 and carries a 16-1 record overall this season. Massey Boys Basketball helps to run the 2016 Senior Girls Basketball All-Star Night in Windsor. See Ontario Basketball recap here. 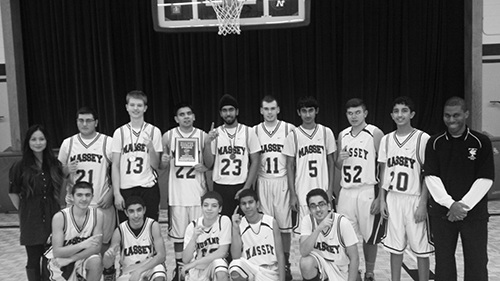 The Massey Mustang Junior Boys Basketball Team finished up their season with a sweet 16 appearance in the Junior Basketball Championship held in Unionville, Ontario this past weekend of Saturday March 1st, 2014. The team had a spectacular season under the guidance of captains Arsh Sidhu, Mohamad Farhat, and Harman Wahid, who lead the team to a WECSSAA SILVER medal, a SWOSSAA Championship, and a Junior Boys Championship Sweet 16 appearance. Massey basketball fans were treated to a season of star performers, such as rookie sensation Ali-Sayed-Ali, three point specialist Damir Ferhatovic, defensive stoppers Moe Bazzi and Cole Desjardins, and energetic players like Talmoor Ali and Joban Dhindsa. The future of the Junior Mustangs will be led by Adam Youssef, Abdurrahman Tayebi, Anoop Khera, and Ahmad Alghizi. We can’t wait to see what’s in store for future Mustang junior basketball----- the sky’s the limit! The team’s slam-dunk success came not only from hard work and collaboration, but also due to the support and involvement of many, from principal Mr. Ash to Coaches Mr. Thomson and Ms. Chab, Helper Deep, and Coach McShan. A last thank you to our supportive staff and fans, who helped make the season a swishing success! Congratulations to the Massey Junior Boys Basketball Team, whose perseverance, determination, talent, and commitment brought them to the title of tournament champions! The tournament was held at Belle River High School the week of January 6th, 2014, and performances did not disappoint! Tournament MVP Harman Wahid showed off his skills and dominated points in the paint, while tournament all-stars Damir Ferhatovic and Arsh Sidhu helped provide the inside and outside punch needed in order for our Mustangs to dominate! Other significant contributions came from Ali-Sayed and starting point guard Mohamad Farhat, who stunned all with their skills, energy, and commitment! Congratulations once again to the Junior Boys Basketball Team, along with our dedicated coaches, whose love of basketball and dedication to the team helped lead them to victory! To add to the bliss of an undefeated season, the Vincent Massey Mustangs junior boys basketball team has been invited to play in the Junior Basketball Championship Tournament in Unionville from Feb. 27 to Mar. 2. Due to limited FUNDS the (17-0) squad will be holding a number of fundraisers to be able to compete in the tournament. “The goal is to raise about $3,000 which would reduce the cost to about $30 a [player]. One thing we have set up is that we have a game against Kennedy on the [Feb] 6 where if we can do a full buyout and have kids to come to the game,” said head coach Keith McShan. The team will test its perfect record against the likewise flawless Catholic Central, before closing out its schedule against Kennedy on the Feb. 6. The match against Catholic Central defense will prove to be a tough test for the Mustangs as the Comets have only conceded an average of 38 points per game this season. On the undefeated record point guard Mohammed Farhat discussed the team motto. The Mustangs have done their part through stellar regular season and tournament play. Hopefully the basketball fans of Windsor-Essex can come through and help this team realize its dream. CTV Windsor "Bob Bellacicco" talk about Massey Junior Boys Basketball "Breaking A Mold": Watch the video HERE.